Heather Pomilio was a 3x All-County pitcher and outfielder finishing her high school career with a .500 batting average, a 3x MVP for softball and MVP of volleyball. Heather was also a 3x Times Daily News All–Star and a former Empire State Games Bronze and Silver winner. Heather received a scholarship to play at Georgia Southern University where she was an All-T.A.C player and was ranked 49th in the nation in hitting. Heather continued to play fast pitch until she was 36 years old competing with the Empire State team. Heather was formerly a PE/Health teacher, special education teacher and Varsity Softball Coach at various high schools across the island. Heather’s fame continued in to slow pitch where as a player, won 3 National titles with the Uniform Pro Mice team, a 3x All-American, Player of the Year for Long Island and inducted into the USSSA Hall of Fame with the entire Mice team. She is a well rounded athlete and coach continually evolving as a student of the sport displaying her passion for the sport. 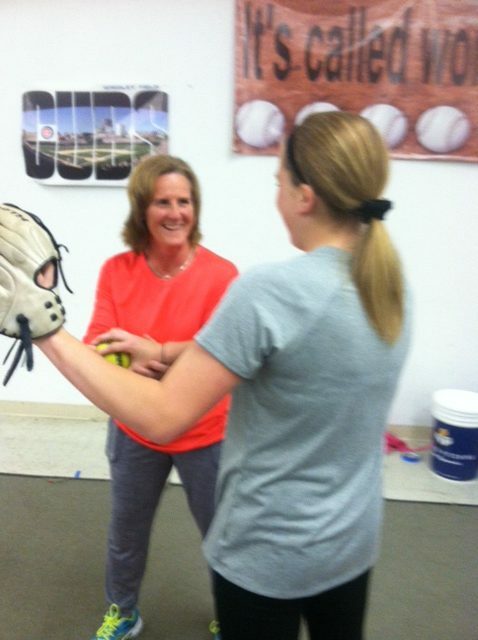 Here’s what Heather has to say about Tincher Pitching: I came to Tincher Pitching because I knew something was not quite right in the way we were teaching pitching. Everything seemed so complicated. And the injuries that came along with it,it couldn’t be right. What was I missing? After studying with Denny, I saw what I was missing: the fluidness, the ease and the ability to self correct. It was all there. How can a kid throw loose and be so powerful with what seemed to be effortless. I was enthralled and knew I needed to change my ways to benefit my players. As a former high school and college pitcher it was always difficult to make changes in the motion without it being complicated. I love teaching and love teaching softball even more so it was time to find a different way to teach pitching to my students. In the short time that I have transitioned my students to Tincher Pitching I have seen gains in consistency, velocity, and confidence in my girls. They all say it’s so much easier, they can understand where they make their mistakes and be able to self-correct. This is exactly what I have been looking for and now I understand how why certain things we were taught years ago just doesn’t work efficiently. I am excited to see the next level of pitchers that will come out of all these amazing instructors. Here is what Denny says about Heather: Heather is a pro, a veteran, and someone who has been through the game at every level. You don’t fool someone like her. She has seen all of the fads come and go, so she was skeptical about joining Tincher Pitching. Within the first minutes of her first visit, she was fully on board. We saw the cautious exterior melt away and the enthusiasm of a little girl emerge as she witnessed pitchers making huge strides very quickly. This Instructor has a gift for teaching, for connecting with kids, and for breaking down concepts in a way they will understand. She is patient and loving, yet demanding. What a combination! We are happy to have her.